I'd like to think that I possess a modicum of common sense.That I would not earn a Darwin Award for stupidity, as I punch out of this life, from a stupid activity. 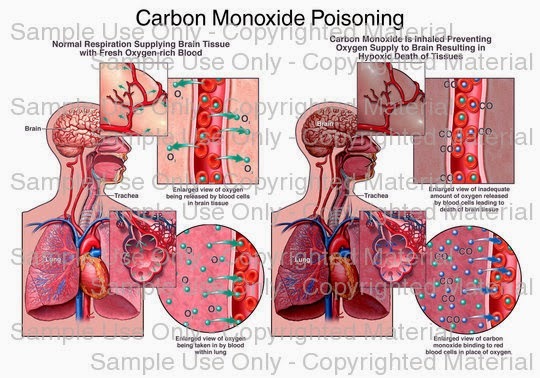 I nearly became a statistic on Thursday night, when I became a victim of Carbon-Monoxide Poisoning! I know the most important thing to remember is to start a snow-blower in a well-ventilated area in order to prevent CO poisoning. Starting it in a closed-up space such as your shed or garage is a bad idea. In my rush after work on Thursday to pick-up kids, have supper, prepare for my 7:00 class at Memorial, I unwisely decided to spend a few minutes ensuring the snow blower was in working order for Friday's anticipated storm. One of the doors was wide-open on my shed, allowing fresh air and ventilation. I could not pull-it over manually, so I plugged it in. After a couple of attempts, the auto start worked and the shagging thing came to life. I pulled the choke down a little, deciding to let it run a little and headed into the house for a cup of tea and a bite to eat before class. 20 minutes later, I put my notes in the van and went out back to the shed to shut down the snow blower, satisfied it was ready for the anticipated snowfall. I did not have a flashlight, just my iPhone to find the key to turn it off. Unfortunately, turning the key and taking it out did nothing to shut it down. The shed was dark and full of fumes and all I could think of was being late for class - how was I going to get this machine to stop running. No thoughts at all of moving it outside the shed. I used my iPhone to read the instructions for turning off the snow- blower. Eventually (20 minutes later), finding the choke, I cut off the flow gas causing the machine to sputter and shut-off. I felt a little light headed and noxious but figured some fresh air would shake it off. I jumped in the van, drove to class, parking the car on the other side of the campus to ensure a longer walk get some fresh air. As I entered the Education Building, I became a bit disoriented, started seating, developed a headache and started profusely sweating. I found my class, found a seat, started taking notes and tried to focus on the causes and effects of price controls on the in-elasticity and elasticity of supply/demand, but my focus wavered. After class, I felt very flu-ish, disoriented and tired, attributing it to skipping supper and forgetting to take my diabetes medication. A quick prick later showed my sugar levels were fine. At about this point I started feeling a stitch in my chest and shoulders and some vertigo. My wife called my sister-law, our go to medical expert who said do not mess around with Carbon Monoxide - the only fix is pure oxygen! Reluctantly, still sort of fighting a trip to the emergency where I was bound to big up some bug or another, Kristine convinced me to head to the Health Science Center. I did manage to squeeze in a call with Johnathan on Night Line on the way over! Within ten minutes of registration I was given a bed, a gown, given a breathing mask with %100 humidified oxygen, an EKG was done and the blood samples started flowing. Fortunately, I did not have a seizure or need the Hyperbaric Oxygen Chamber. Four hours later, my blood samples were still testing positive for CO poisoning and I was being told that I had the blood of a heavy smoker (i do not smoke). I had dodged the bullet! The egg-salad sandwiches at Caul's Funeral Home will have to wait! Short of a little bit of grogginess and a slight nagging headache, I am feeling fine. A chronic poisoning that is even at a low level can not be cleared up with a bit of fresh air. You may get some relief but the deterioration may be gradual so it could be some time before you notice. If you begin to feel sick, dizzy, or weak, you should leave the area at once and get some fresh air. 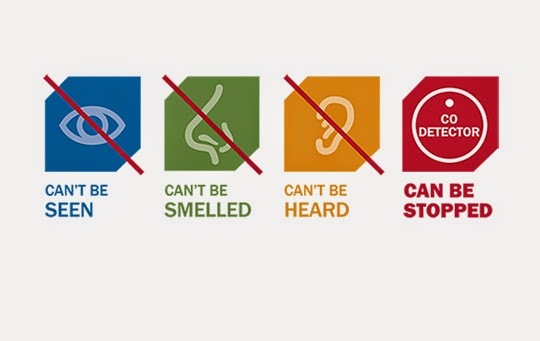 These are the initial signs of carbon monoxide poisoning. Call your local medical emergency number for aid. What did I learn? That will make for a another post, but it is vital to know that carbon monoxide poisoning is an important factor in the operation of snowblower! . Starting it in a closed-up space such as your shed or garage is a bad idea! Do not leave a snowblower unattended after it has been turned on - even in a well-ventilated area. Respecting snowblower safety guidelines regarding CO poisoning will ensure that no harm comes to you or your family.